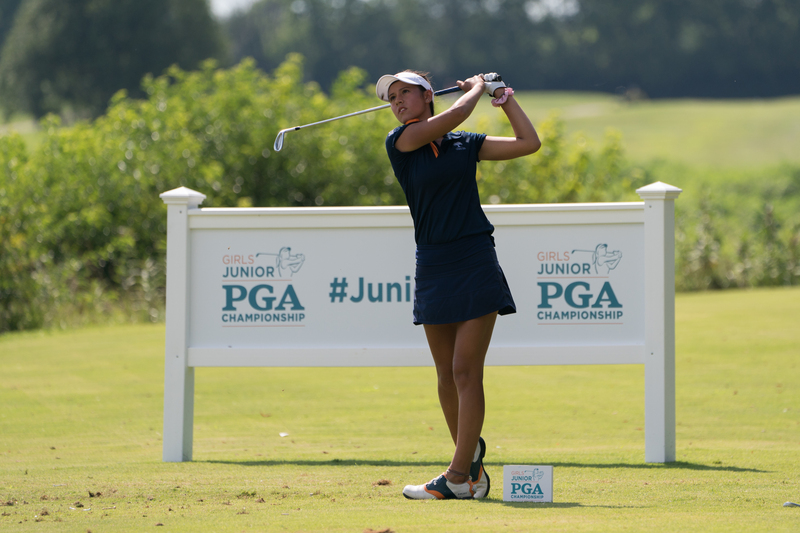 LEXINGTON, Ky. (July 9, 2018) – Monday at the Girls Junior PGA Championship was a day to remember for Alexa Melton. The 17-year-old from Covina, California, fired a 9-under-par 63 at Kearney Hill Golf Links, which set the lowest 18-hole score in the Championship’s 43-year history in addition to her personal record. Making her first appearance in the Championship, Melton tore through her first nine holes (Kearney Hill’s back nine) with five birdies. She exceeded this pace through the first three holes on her back nine with a birdie and eagle on holes 1 and 3 to reach 8-under through 12 holes. The lone blemish on Melton’s scorecard came at the par-5 7th hole. A failed lag putt left her with six feet to convert a par, which she would ultimately miss. The sting of this bogey wore off quickly, as Melton bounced back with a birdie on her second-last hole of the round. One of the veterans in the field, Erica Shepherd of Greenwood, Indiana, is making her third appearance in the Championship. A back-nine surge vaulted Shepherd into 2nd place, two strokes behind Melton. The Duke University commit (class of 2019) birdied four of her final five holes to finish with a bogey-free 7-under 65. As alluded to by Shepherd: in addition to competing for a national championship, all contestants with U.S. citizenship and members of the high school graduating class of 2019 or younger will have the opportunity to earn an exemption onto the U.S. Junior Ryder Cup Team. The winner and runner-up in this week’s Championship will automatically make the team and compete in the 11th Junior Ryder Cup. The biennial matches between the U.S. and Europe will be held at Disneyland Paris on Sept. 24-25. The 2016 champion, Lucy Li finds herself in familiar territory near the top of the leader board after posting a 6-under 66. Seven birdies on the day, including four straight on her back nine (Kearney Hill’s holes 3 through 6), elevated Li into a tie for 3rd place with Yealimi Noh after 18 holes. A lapse in concentration on hole 7 cost her a stroke, as she missed a one-foot putt resulting in a bogey. Like Melton, Li recovered with a birdie on the next hole. Last year’s runner-up, Noh carded a flawless 66 that featured six birdies; three a piece on each nine. The Concord, Calif., resident took advantage of the par 5s by cashing in birdies on three of the four. Yuka Saso of the Philippines rounds out the top 5 after carding a bogey-free 5-under 67. Grouped with Li, defending champion Rose Zhang posted a 4-under 68 and currently resides in a tie for 6th place with Sabrina Iqbal (San Jose, Calif.) and Megan Furtney (South Elgin, Illinois). At the Country Club of St. Albans (Missouri) in 2017, Zhang matched the Championship’s low records for second and third round scores, as well as the 72-hole total. She also set the record for lowest 54-hole score. The record book will be amended once again after Melton’s performance on Monday, as she replaces the following players who carded 64s: Hailee Cooper (2017), Mariel Galdiano (2016), Leigh Anne Hardin (1999), Virada Nirapathpongporn (1999) and Yojeong Son (2015).